The Internet is an amazing platform as people have been using it to post such remarkable things that astonish the human brain. Optical illusion has been used to deceive the human brain since ages. It has proved several times that not everything we think and perceive is always true. Recently, Akiyoshi Kitaoka a Psychology professor posted an image online that will make your whole life a lie. An optical illusion image was shared earlier this year by Akiyoshi Kitaoka in which there is a strawberry tart covered with strawberries but none of them is red. You might be thinking how that is possible. 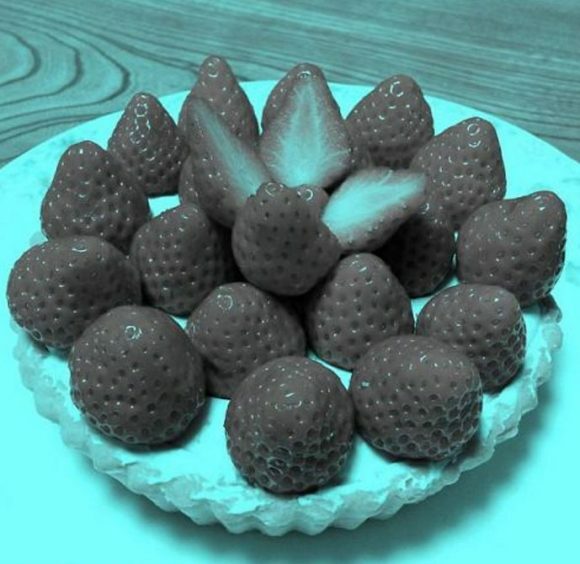 The strawberries in image contained cyan pixels. In order to prove it wrong, many individuals isolated the parts of the where the strawberries showed red color. When placed on the white background there were only gray and blue shades. Under a range of certain circumstances, the human brain will perceive the same color. The sensory system of the human is just amazing. When many factors like light, atmosphere, and surroundings are affecting the appearance of an object, all we will notice are the constant shades that have been perceived by our mind. Here the major concept is that we know strawberries are red even without looking at them. This is one of the biggest reasons that they also appear red to our eyes in the image. This is the reason that we often miss the complexity of the objects. Humans have a special sense unexpected due to which they are always amazed by the color adapting images and optical illusion. We have the desire to learn many new things but in reality, we will only perceive what we have learned. Optical illusion changes the way we perceive the world. The viral strawberry color-adapting image allows our mind to look at the world in a completely different way. Optical illusion helps us to open the horizons of our mind to notice the things around us in a new way. So we can say that if it not for color adapting images we would have a same boring perception of the things around us. The optical illusion is a solid proof that our brain is nothing more than a piece of meat that is controlling the functionality of the body. However, there are several hidden qualities in the mind that can only be exposed with the help of optical illusion and other such kinds of activities. To understand the science behind color adapting images we must allow our mind to accept the changing realities. WHAT DOES THIS COLOR ADAPTING OPTICAL ILLUSION REMIND YOU OF? WHILE YOU PONDER IT, CHECK OUT THIS AWESOME HANDBAG OPTICAL ILLUSION! Prev Are Your Eyes Sharp Enough To Spot A Camouflaged Snake? Next Is Your Brain Tricking You To See This Dress As White?